Dr Johnson drew one of these conclusions, Alan Partridge the other. London’s usually been more Johnson than Partridge for me, mainly because I visit and don’t live there, thereby avoiding the huge rents and long commutes of a life spent living in or near the British capital. Having seen most of the sights over the years my visits nowadays are weekend breaks with my other half, or to visit friends. Over time I’ve found a number of tried-and-tested spots in the city, tried and tested. Here, in the spirit of a recent post about New York, are five ways into London. With my dignity intact, hopefully. We usually stay near Portland Place, an office-tastic enclave that’s just five minutes’ walk from Soho Square. A year or so ago, walking along a side street off the Square we came across Milkbar, a small brew room serving coffee hailing from the unlikely bean hotspot of Stockholm. A flat white order necessitates a hipsterish 10-minute wait in a mostly-empty room, but it’s worth it. If I’d a Ulysses first edition for every time I’ve heard a store labelled ‘a temple of books’ I’d be, well, probably buying armfuls in Daunt Books. Less a temple and more a neatly-kept church of reading, the bookshop – on Marylebone High Street – boasts an impressive gallery-style main room, lined with travel and history books. Daunt Books is known for the two genres, but elsewhere there’s plenty of the usual fiction, literary tea towels, pricey Moleskine-type notebooks and posters too. The main room’s the gem, though. Away from the crammed dens of Soho the gentlemanly Masons Arms in Fitzrovia is the type of London pub you read about but usually find full of tourists or stressed office drinkers. Come here on a weekend and you might meet Hector (ab0ve), a French bulldog and regular. Aside from his company the bar offers four cask ales, four storeys of floral displays to the building and oddly (or perhaps not so oddly, all told) also does a sideline in Thai food. And the counter tops are perfectly-sized for newspaper reading – a vintage pub all round, then. 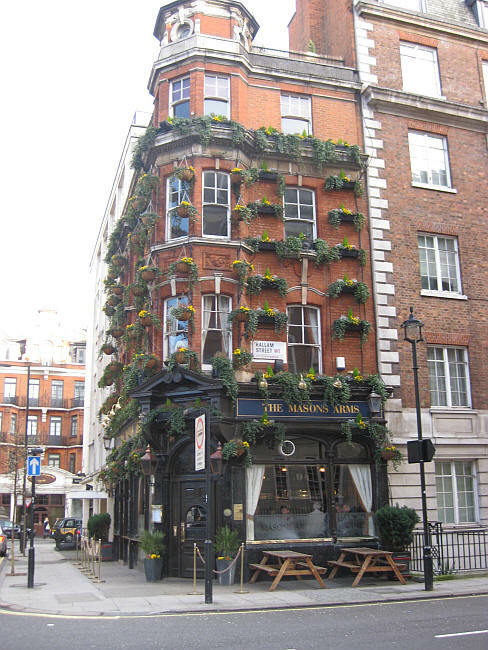 It’s not big and it’s not clever – which is why I try make it to St John Bar and Restaurant whenever I’m in London. Fergus Henderson’s ethos and reputation is well documented, as is his roast bone marrow and parsley salad. This time we skipped the restaurant, opting for a table in front of the bakery and a nibble through the bar menu. What to order after smoked mackerel, black pudding under fried egg and Welsh rarebit? How about the plate of Beenleigh Blue, Innes log, Federia and Riseley, washed down by the house’s own label cabernet-syrah? Which left just enough room for the burned cream at the end. “The road of excess leads to the palace of wisdom”, said one of the city’s famous sons. In my case the palace of excess on St John Street led to a road of martyrdom around Regent’s Park the following morning. The Outer Circle run clocks in at 4.5k, but any dawn excursion should go straight through the park itself, taking in the lake and gardens. You could walk, of course – this being a city known for its genteelity – but where’s the excess in that? Luc Lac pork banh mi, with salad and broth. Want to try the world’s best sandwich? Fly to Portland, Oregon, take a cab from the airport direct to the corner of 2nd Avenue and Taylor Street, walk into Luc Lac Vietnamese Kitchen and order the grilled pork banh mi. The commute might cost a few hundred euro but the sandwich itself is just $8. If it’s the middle of winter (as it was when I ate there) and you’re feeling flaithulach, go for a bowl of broth on the side. This is a lunch which could restore your faith in many things – the much-abused art of the sandwich, pork with proper flavour, humanity itself (if your visit follows 17 hours of flight and a chilly morning dodging showers blown up from the Willamette). We discovered this when we hit Luc Lac a day or two before Christmas, our heads still somewhere over the mid-Atlantic, in need of sustenance. Our knackered palettes rejoiced. The moist pork was mouth-melting, the part-rice flour bun the right side of light, the broth a restorative to rival Jameson’s finest. It was the Greatest Sandwich In the World. Ok, I may be exaggerating. Just a little. I’ve had plenty of good sandwiches in recent times, and even a few good Vietnamese ones (not least at my father-in-law’s LA staple Golden Deli) – but none of the latter in Dublin. It’s not for want of shoe leather. For the past couple of years my wife and I have sought out a banh mi whenever we’ve spotted a new Vietnamese place in our home city. Finding these eateries is easy because there’s so few of them – Vietnamese food hasn’t made the same inroads on the Irish palate as Chinese or Japanese. My favourite in Dublin, Pho Ta in Temple Bar, serves banh mi but not on a rice baguette. 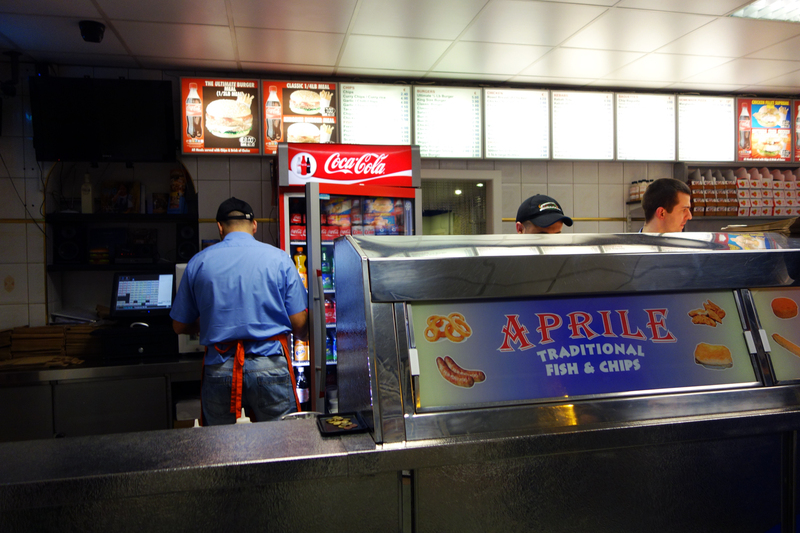 The situation is similar at Aobaba on Capel Street – the filing’s the familiar pork but the bun’s all too Irish. Walk up to Parnell Street’s Pho Viet and you’ll get a great pho ga (chicken noodle soup) but won’t find a banh mi on the menu. A discreet ‘what’s up with the bread?’ enquiry to a staff member at one of these places yielded the answer that no bakery in Ireland makes baguettes using rice flour. Yet. Given Dublin’s bread revolution this situation will surely change soon. After all, 4,600 miles is a little far to travel for a sandwich. Unless you’ve tried Luc Lac’s grilled pork baguette. Many words have been associated with David Bowie in recent days – among them ‘visionary’, ‘icon’ and – naturally enough – ‘starman’. Because Bowie – along with being Ziggy, Aladdin or just David Jones – was a sandwich man. Amidst the reams of coverage of his death this week I read a quote from an Irish caterer, who recounted how the star’s after-show snack-of-choice in the 1980s was a cheese sandwich. In latter days, according to Danilo Durante, owner of Bottega Falai in New York’s Soho, it was Parma ham, accompanied by a strawberry sfogliatella pastry (well, he was a rock star after all). Ziggy had taste. When it comes to sandwiches the Italians – in the face of stiff competition from the Vietnamese (the glorious banh mi) and the Americans (the dripping Reuben) – do it best. If I needed further evidence of this, apart from that provided by the late Mr Bowie’s dining habits, I encountered it on a visit to Santa Monica a fortnight ago. Braving the hordes of big, small or any-screen wannabes my brother-in-law and I hit Bay Cities Italian Deli – a staple in the area since 1925. The place, and it’s ‘Godmother‘ sandwich, therefore have something of a reputation. A reputation which accounted for a three deep throng at the deli counter and a 20-plus minute wait for service. The Starman himself would have been happy – there was prosciutto (and just about every other type of cured meat) aplenty. I, however, used my Italian sandwich acid test – order one with burrata. My all-time favourite sandwich, Fiore Market Cafe’s roast chicken, features this soft cheese. The Bay Cities option was a burrata caprese – essentially a caprese salad in a roll, with the mozzarella subbed out for the softer cheese. The purists may be sceptical, but it was perfect. The burrata was creamy cold and cut through with just enough sliced onion. The tomatoes and basil were as good as you’d expect in a 90-year old Italian deli. And the whole deal was served up on still-warm house bread. I didn’t want it to end. All this is a long way from a 60-something David Bowie nipping out for a quick ham roll on his lunch break, of course. That said, Bowie did play a famous show in the Santa Monica Civic Auditorium in 1972 – a venue just a few minutes stroll from Bay Cities Deli. Did he pop in for a cheese sandwich? He should have.